A well-organized garage is one of the most useful areas in a home. Few upgrades make a garage look as sharp as newly finished walls. Add the latest in stylish storage units, and you will have a space that rivals any room in the house for pure good looks and absolute functionality. Today, the best garage ceiling storage solutions come in many different styles as well as configurations. 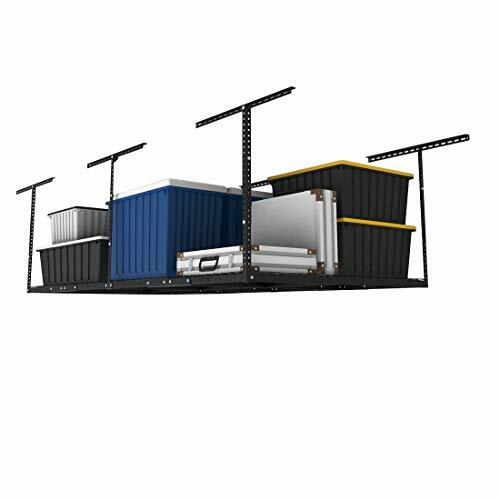 The most popular solutions being integrated grid structures that allow you to store seasonal items overhead and out of the way. Let’s check out the best solutions in the market. 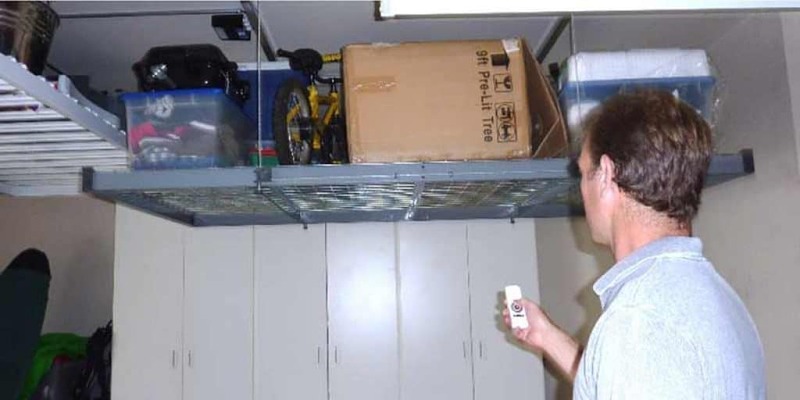 The very first thing that you must consider when shopping for the best garage ceiling storage in 2019 is storage size. It is a mistake to choose an overhead storage too small for convenient use. You can choose between fixed size and expandable storage. Fixed overhead storage is ideal if you have a precise number of items to stow. If you anticipate that you will need more garage ceiling stowage in the future, you should consider buying an expandable system that is fully customizable. You can also settle for extra capacity. In this case, you should choose an overhead storage system with wall mount brackets. This will allow you to secure the overhead storage to the wall, increasing its weight capacity. You might have everything else right, but the weight capacity. How much weight you want to load on your ceiling-mounted racks will determine the type of overhead rack you will choose. Conventional garage overhead joists can typically support fifty pounds per square feet. Exceeding the weight capacity can damage the rack. The best overhead garage storage comes with joists made of the strongest steel or wood material. And always know that metal trusses do not support the same weight when compared to wood. The load capacity usually differs with respect to the beam construction. Z-beam and L-beam designs have less load capacity. Racks with a higher weight capacity are made of heavy c-channel beams. If your garage has limited space or has a devastating amount of items, then you should settle for overhead stowage with adjustable heights. With an adjustable height design, you can suitably lower or raise the racks to increase or decrease vertical storage space in order to accommodate more items. Most height adjustable models can be adjusted from 22 inches to 40 inches, providing you with safe and convenient vertical space for stowing your stuff. The best overhead garage storage must fulfill a number of safety features, the first one being clearance, which determines the required installation space. An obvious mistake that you can make is to measure the required space when your garage door is opened. It is always advisable to do so when the garage door is closed. If you plan to add a shelf in the void between the top of your open overhead garage door and the ceiling, you will need at least nineteen inches of clear open space to allow usable storage without intruding on the door’s operation. Also, try to avoid placing the racks too close or adjacent to the garage door tracks, which can easily limit usable storage space. If you are planning to install an overhead rack in a location near the garage door, you must ensure that there is enough clearance between the door and the ceiling mounted racks. Apart from the clearance, make sure that the product comes with all the required fastening bolts. The rack should be properly secured. The rack should also have a safety lip of at least 2 inches to prevent your stuff from falling off. Do you want to avoid the dangers associated with climbing ladders when arranging items on a regular overhead storage system? Choose a motorized overhead storage. With an overhead system, you can easily and conveniently lower or raise the racks by simply pressing a button. This makes loading and unloading remarkably easy and safe. The best overhead garage storage motorized systems use a wall mount push button fitted with a keyed lockout that prevents unsanctioned use. If you choose to buy a motorized system, you should ensure that it is made of the thickest and strongest steel (such as 14-gauge steel). The system should attach to at least four joists, and its height should be at least thirteen feet. The best storage should have a weight capacity of at least 400 pounds. Another important feature to consider when shopping for the best garage ceiling storage is universal compatibility with your ceiling. Your ceiling should have universal compatibility with the various ceiling joists. You should be able to mount the ceiling rack on wall studs or concrete wall. Are you looking for the best garage ceiling storage with universal compatibility to the ceiling of your garage? Look no further than the Fleximounts Overhead Garage Storage Rack. 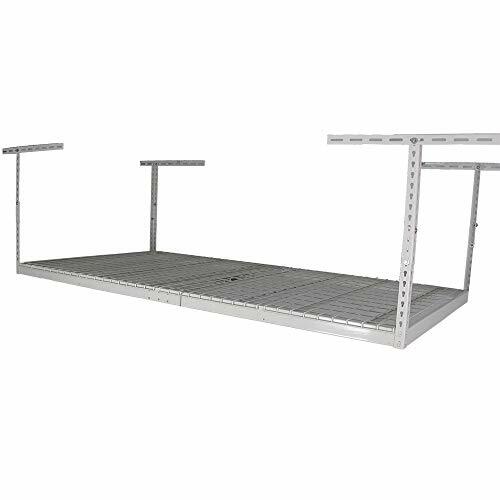 This metallic, 4 x 8 ft. overhead rack is available in one-pack and two-pack, and in either black or white colors. It has an integrated grid design made of strong cold-rolled steel with a loading capacity of 600 pounds. The weight capacity has been tested to its limits. The height of the Fleximounts can be adjusted from 22 inches to 40 inches to increase or decrease drop down space. The drop down offers up to 105 cubic foot of storage. 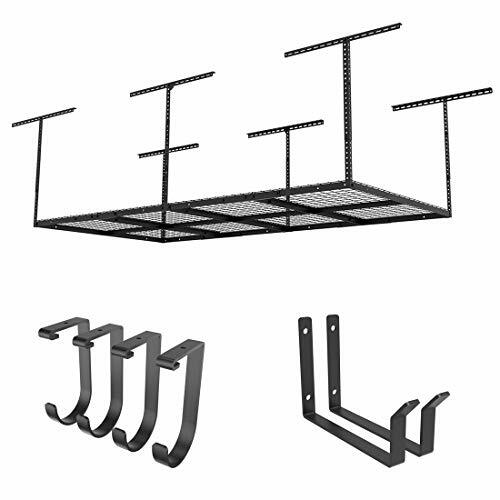 The rack is suitable for both solid concrete ceiling and ceiling studs. However, you have to check the ceiling space or structure before you invest in this product. Unlike conventional overhead racks, this particular product comes with bolts and M8 screws. These hardware are top-quality, and they offer maximum safety. You do not need special skills to install this product. It comes with an installation template that is easy to decipher. There is also a YouTube installation video. The manufacturer also sells accessory hooks that you can buy separately. You can install the hooks on the grid or the joists for hanging bicycles and hand tools among other things. Weight Capacity: Up to 550 lbs. The HyLoft 00540 is built to last a lifetime, and it is the ideal way to make good use of the unused vertical space in your garage. This unit provides you with an organization for your attic, basement, or garage. Its structure is compatible with most joist configurations. It is made of steel construction that is not only innovative but also durable. The steel structure has a powder coat finish that is scratch resistant and a loading capacity of around 250 pounds. It is one of the most versatile ceiling storage systems with an adjustable height that ranges from 17 to 28 inches. The vertical space provides you with over 30 cubic foot of storage. You should not be overly concerned if you have a roof with joists that are spaced at 24 inches apart. The HyLoft 00540 will work with such a roof. However, its stability depends on the weight the rack will be carrying. You are advised to use long screws in order to prevent the hangers from moving. The necessary installation hardware is usually included for a quick assembly. 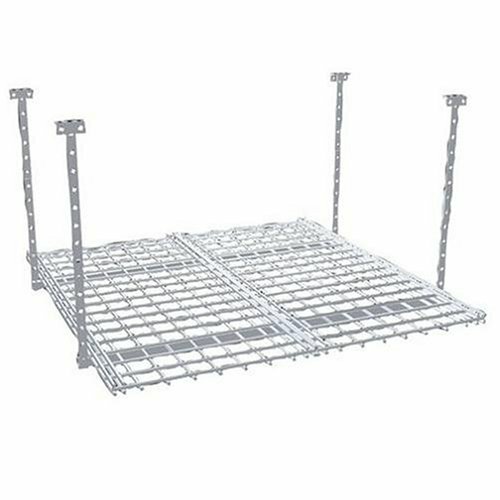 One of the things that you might probably not like about this rack is its lightweight structure, which has a limited loading capacity. It may not be the best choice for bulky items. Are you in need of a lightweight overhead storage system? The HyLoft 00720 is one of the most recommended choice. It comes with a basic steel construction with a white powder coat finish, which is scratch resistant. This is a compact ceiling rack that measures 36 by 36 inches. However, the small compact size doesn’t necessarily mean that the HyLoft 00720 is a weak rack. It is capable of supporting up to 150 pounds. It has an adjustable height that ranges from 16 to 28 inches, which can fit a variety of joist configurations. The design is also usable with finished and unfinished ceilings. This storage unit does not have hangers. However, the simpler wired design is suitable for a straightforward application. But it may not be the ideal choice for bulkier items. 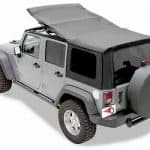 The design is easy to install, but you have to know where the ceiling joists are located in order to be able to come up with a good layout for hanging the rack. Installation hardware is included. Depending on your ceiling design, you may need longer screws than the ones provided to get this unit to fit securely. Weight Capacity: Up to 150 lbs. Do you have bulky storage bins that won’t fit your regular overhead storage? 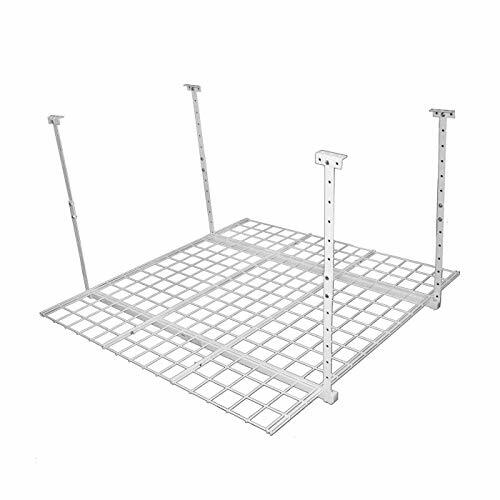 Choose the MonsterRax Overhead Rack to get the maximum storage capacity. The MonsterRax is made of heavy-duty steel, which is combined with a secure fastening system and a powder coated finish. The white model has silver decks and white powder coat rails. The patented design is engineered to support up to 600 pounds and has a breaking strength of 1,500 pounds. You are strongly advised by the manufacturer not to exceed the weight limit. You can customize the drop length from 18 to 33 inches, providing you with sufficient vertical space for storing several storage bins among other things. Regardless of its huge size, the MonsterRax isn’t difficult to install. However, you will have to correctly locate your ceiling studs for the installation to be successful. You might probably be concerned about the sturdiness of this model given the fact that it has only four support beams without the mid-sections beams. But its construction is remarkably strong. The MonsterRax screws are durable, but you may want to switch to galvanized screws (case-hardened and heat-treated) for a sturdier and safer assembly. Make the most of your garage’s ceiling space with the MonsterRax Overhead Garage Storage with 24 to 45-inch ceiling drop. The ceiling drop allows you to extend vertical storage. This heavy-duty rack by MonsterRax is designed from industrial strength materials and finished with a powder coat for strength and durability. The patented MonsterRax design is 4 feet wide and 8 feet long with a holding/loading capacity of 600 pounds. The weight limit is backed by a lifetime warranty. This unit mounts to four heavy-duty ceiling beams, which diffuse the load for solidity and safety. It has unique rail connectors that not only support the side rail but also get rid of flex. This MonsterRax rack comes with more than enough bolts and lag screws for maximum security. Also, the rack has a safety lip that surrounds the entire structures to help prevent your boxes and bins from slipping off. Installing the unit isn’t as hard as you may have imagined. The support arms and brackets fit together. However, the ceiling braces have to be level for all the pieces to fit together properly. SafeRacks is another groundbreaking design worth the money. The rack is spacious, measuring 4 x 8 feet. It provides adequate space for stowing storage bins and boxes. This overhead rack is engineered from industrial strength metal with powder coat finish, making it sturdier and capable of supporting more weight compared to conventional designs. The patented design can hold a maximum of 600 pounds. A lifetime assurance backs this weight capacity. However, the manufacturer advises you not to exceed the recommended loading capacity. What you would probably like most about this overhead rack is the customizable drop length, which can be adjusted from 18 to 33 inches from the ceiling. When you drop the rack to 33 inches, you get enough vertical space for loading storage bins on top of each other. Also, there is sufficient space left below the rack. The installation is easy to do yourself. Actually, the hardest part may be finding the studs on your ceiling. You may need to add lags screws to make the rack fully secured. You can also buy accessory hooks that you can attach to the rack so you can hang bicycles and stuff. Alternatively, you can tie cords beneath the rack for hanging items. Do you need extra storage space for putting away storage boxes, bins, and other bulky items? The Fleximounts Overhead Garage Rack with add-on hooks is what you need. With a space of 4 x 8 feet, you have a sufficient surface area for loading boxes and bins. The drop length of 22 to 40 inches provides you with up to 105 cubic feet for loading boxes on top of each other. Like most Fleximounts products, this overhead rack is made of 14 gauge, cold rolled steel. The steel is super strong with a loading capacity of up to 600 pounds. 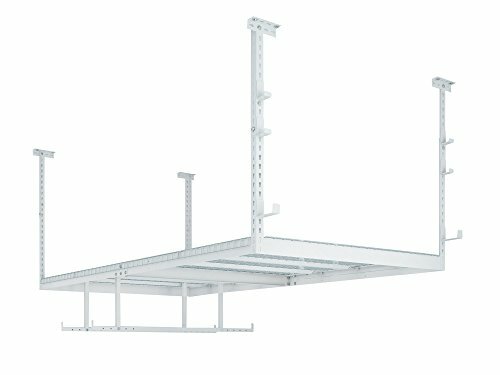 Unlike most garage ceiling racks in the market, this one has an integrated grid design that is remarkably easy to install. It does not require a different installation of the wire and frame. What is most impressive about this rack are the included accessory hooks. They are designed of durable and strong steel with a powder coat finish that is scratch resistant. The hooks have a holding capacity of up to 26 pounds, and they can be used to hang bicycles, extension cords, lawn chairs, sporting goods, and tools. They help you take full advantage of the space below the rack. Increase your garage storage space by organizing it with the SafeRacks Overhead Garage Storage Combo Kit. This kit will provide sufficient space for all your seasonal items. Not only does this overhead rack free up useful floor space in your garage, but now you will be able to fit your car into the garage effortlessly. 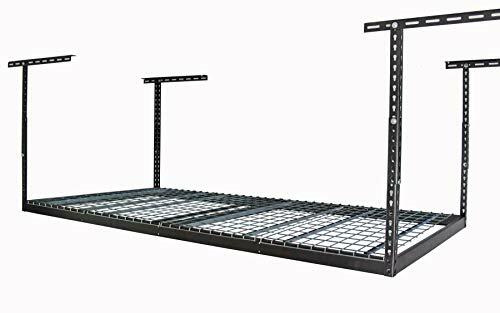 One of the features that make this rack one of the best overhead garage storage is the industrial strength steel material with a powder coat finish. The steel has a remarkable breaking strength of 1,500 pounds. 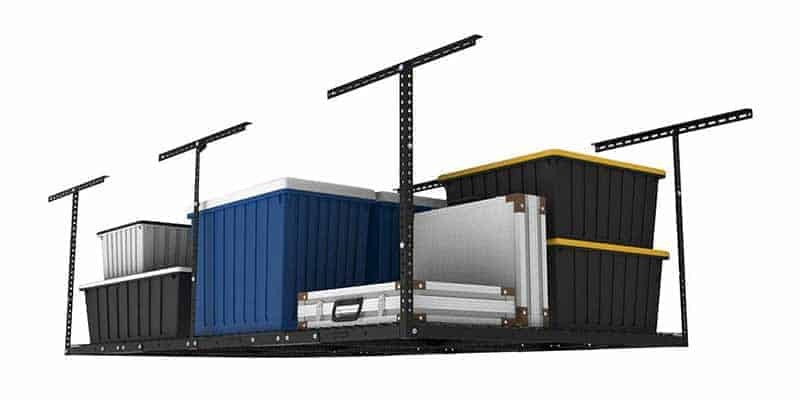 This model has a maximum loading strength of 600 pounds, which is backed up by a lifetime warranty, but only if you buy the overhead storage system from SafeRacks. Do you have lots of boxes or bins that need additional vertical space? This ceiling storage unit has a customizable drop length from 18 to 33 inches, providing you with usable dropdown space. Unlike most conventional units in the market, the installation of this rack is quite simple. All you have to do is locate the ceiling studs. It comes with accessory hooks made of durable steel. The hooks help to maximize storage space on the sides as well as below the rack. You can use them to hang sporting items and bicycles. Time to get organized with NewAge VersaRac Overhead Storage Rack. 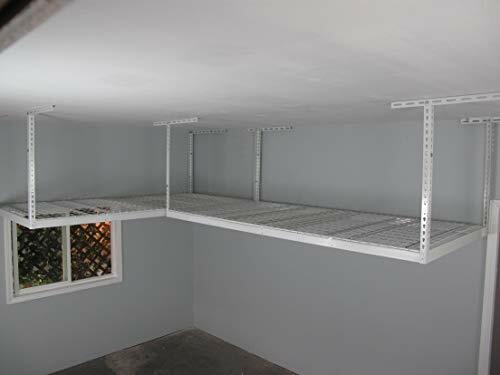 This strong steel overhead rack comes in a white and gray shade that adds that clean look into your garage space. It can support up to 600 lbs. of weight, making it ideal for storing large and heavy items. The support beams are made from good quality steel and coated with scratch and rust resistant powder. This rack not only protects your stuff from water and moisture but also keeps away children and pets from messing up with your tools and other items. You can customize the drop-down distance to your own liking, between 27 and 42 inches from the ceiling. The space is enough to fit stuff like toolboxes, bikes, spare tires, and camping gears, safely. When your garage is well-organized, accessing your stuff becomes much easier, in turn, saving you more time and space. The width is adjustable from 6 to 8 feet, providing you with more organization. This product is convenient to every homeowner as it can be installed into any type of ceiling. The racks are well-ventilated for proper airflow. Also, the rack comes with a well-illustrated installation manual. 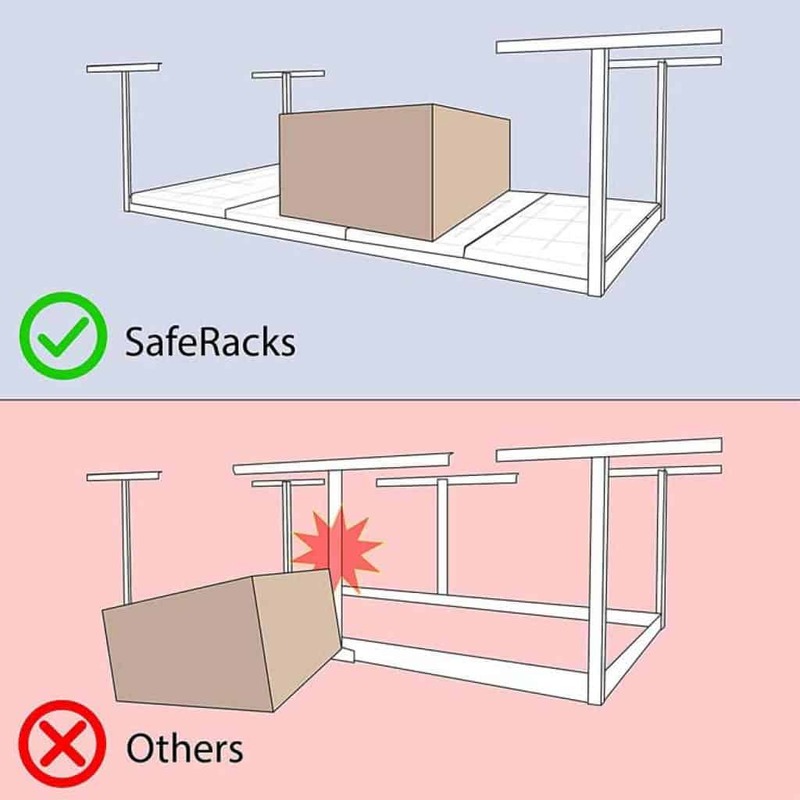 The information provided helps you install the overhead rack securely and safely. I have really done my homework in selecting the best garage ceiling storage that would provide you the best value, performance, and durability. Now, it’s your turn to make the selection. 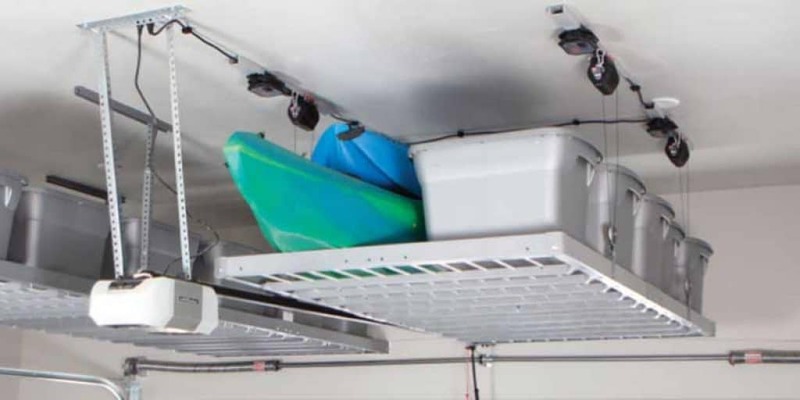 With ceiling-mounted garage racks, you can store away stuff that you don’t use very often. From drive-on ramps to athletic gear, can be moved up and off your garage floor. Sure, there are lots of overhead garage racks out there, but you have to consider your specific storage needs with respect to the size and design of your garage. Basically, you need a storage system that is solidly constructed and easy to assemble. I recommend a unit that comes with accessory hooks or one that can be used with hooks. Also, remember to consult your garage plan before you make an investment, making sure you have enough space for the overhead rack to fit without interfering with operations of the garage door. I have a pitched roof garage, therefore I need the best garage ceiling rack on the market. Also, Can the rack be removed after it is installed?